If I only had a brain... I was humming this song when I donned the Limited Edition Tin Man necklace (above) and ruby slipper earrings from Puarangi Designs. There's always a good reason to wear a charming necklace like this one, especially on those low-brain days! It comes from Hibiscus Flossberg's Puarangi Designs, (at Winter Booth 1). I'm always delighted when a blogger turns designer, and I adore the items that the talented blogger Nissa Nightfire sent from her Magpie* jewelry line. The colors are bright and the designs are eye-catching and carefully rendered. Below are her Beaded Key Necklace in green-purple, Gear earrings in black-red and orange-pink, and Gear flower collar in ruby-black and orange-pink. You can find them (at Autumn Booth 4). Happy 50L Friday, happy Cioccolato festival, and happy Jewelry Fair! I have to run shortly, but I do have this to say: floating bunny "Paz" dispensers make me happy. It's from the Cioccolato (Gacha Festival). Violet Voltaire figured out a way to turn her Second Life creativity into first life creativity by starting a jewelry business. 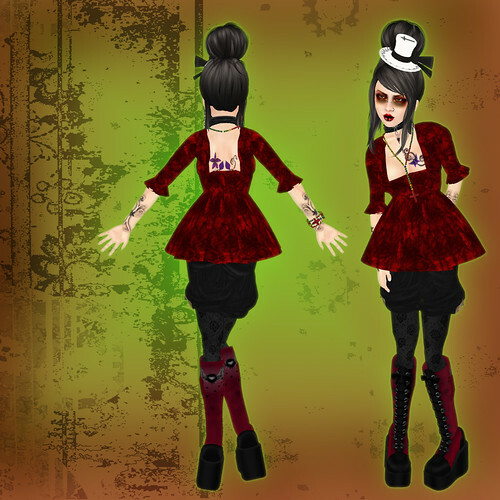 I love her FL stuff, but I'm so very happy that she's back to creating for SL too. In honor of the Jewelry Expo (today through Sept. 27), she's created two new sets. My bottom photo shows Violet Voltaire's Love in a Void sets in black and white. It comes with a necklace and bracelets. The top two photos show some of Violet Voltaire's Doll Face sets with different cameo Kewpie doll faces (in Chola, Goth, Harajuku, Punk, and Steampunk). I've shown the Chola, Goth and Steampunk in this post... Go see these at her booth! Find SLURLs to the expo here at this post. 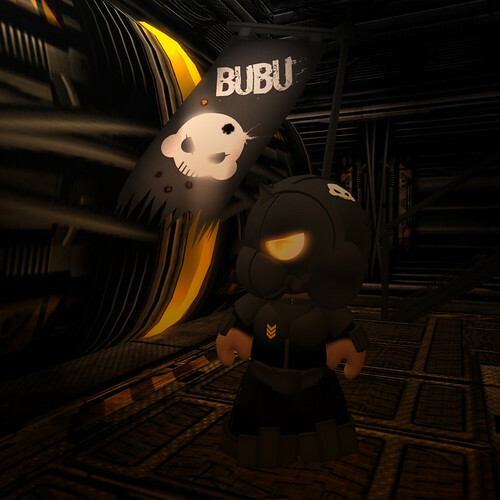 It's been some time since I stepped out onto the blogging field, but I'm back in action and packing a punch with my review of the [BUBU] Army. Thanks again to Ach for letting me tread through here! I'm pleased to tease you today with the Sable Rose Zydeco Ladies Twisted Strand Jewelry sets in black (above) and light (below). The set comes with earrings, bracelets, and a necklace, and the effect is beautifully realized. The triple varicolored strands are set with a cameo broach that lies right over the collarbone cleft. The bracelets echo the twined strands in a smaller size, and the earrings drop to tap the skin below the lobe. So delicate and pretty! This will be available at the Jewelry Expo (September 18 - 27). Hang onto your metrosexuality, boys, because Schadenfreude has come out with a new line of makeup. Yes, makeup. Yes, for boys. It's so bright and shiny and glam that even boy-me insisted upon something pale and manly to wear with it. 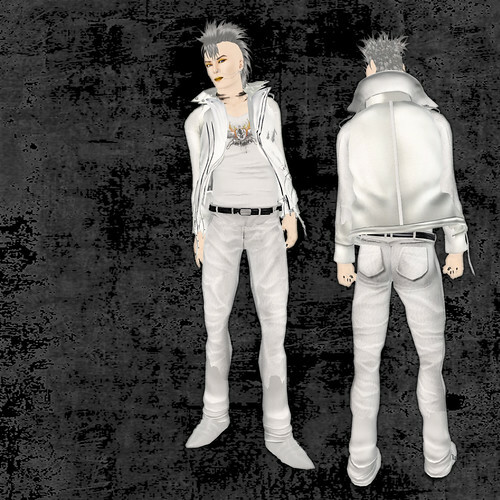 I decided that I'd finally succumb to the lure of the new Aoharu line, and got this nice white coat and pants, a neutral palate for all this color. I love how unabashedly brilliant the eyes and lips are. 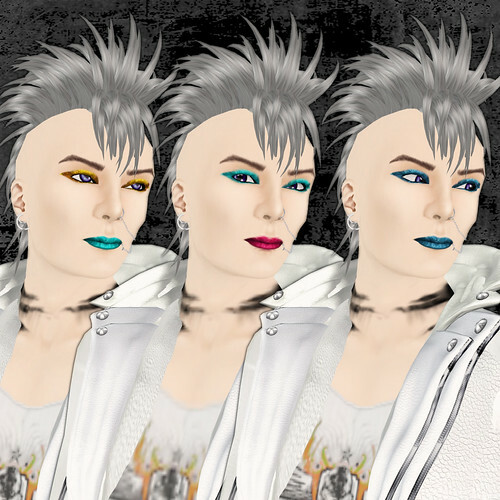 I actually had to make my male shape's lips thinner, because lipstick on the very generous line of the Parachute lips made him look, well, like a crossdresser. Thinned out, his lips are bold and manly instead of c***s******* (*cough*). 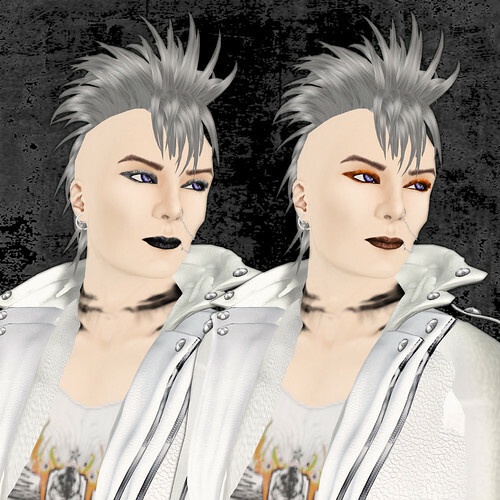 Find these awesome makeups (here at Schadenfreude), and the coat and pants (over at Aoharu). 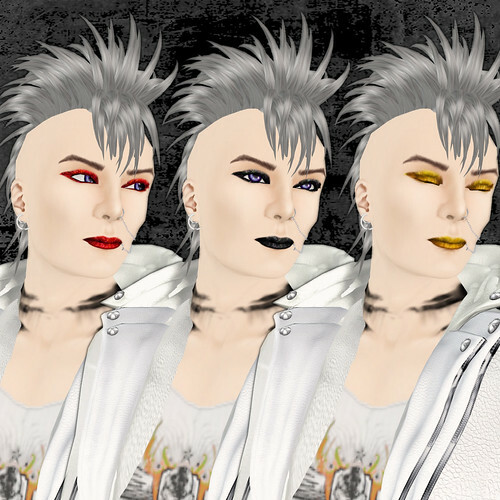 ***Skins: Schadenfreude Cameo orpheus diamond dogs sapphire, ruby, onyx, gold; and Schadenfreude Cameo Orpheus Rock&Roll Suicide Silver, Orange, Gold, Cyan. I love the Jewelry Expo (September 18 - 27). Creators seem to excel at this event, and every year there are several amazing offerings that leap off the vendors and into my pocketses. My preciousss... Kunstkammer's creations this year include the Black Forest Suite (above), the Carnival Earrings in Fae (below, right) and Diamond and Mokume Gane Pendant Set (below, left). ...They're bloody gorgeous. I can't wait for the fair! Ezura has recently put out the Fuego set. ...Heh. 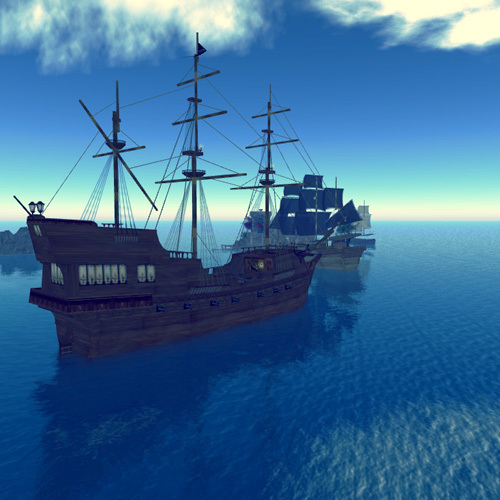 The word 'Fuego' brings back memories of my first week in Second Life. On n00b island, someone handed me the Fuego! gesture -- if you wore it and said Fuego!, you'd burst into flames. Then you'd have to say it again to turn the gesture off. I had much fun with this in Caledon dances... But yes, back to the present, I am unable to see flames on the dress but I still find it lovely in a steampunk cabaret way. The outfit comes with a less revealing skirt, but I wore this one to sneak in the ~silentsparrow~ lepidoptera tattoos that I've been wearing all week. I love this tattoo set, and the colorful fatpack is extremely reasonable. (SLURL to Ezura), (SLURL to ~silentsparrow~). In other news, I was on Fabulous Fashion TV again last night, after a long, early day of teaching. I have a vague memory of daring Angie Morningstar to wear Tomo's rose eyepatch the next time she hosts... You can eventually download the video from the archive here, if you wanna, and I'll be in the last nine minutes. Bonus photo: Antonia Marat was kind enough to come see me last night -- look at her (kinda cool) crutch AO! Poor avvie! This tiny dress is by Sangre Noir -- it comes in a vaguely modest version with lace up to the neck, and the skirt is so short that without adding bloomers, my bum was saucily sticking out. 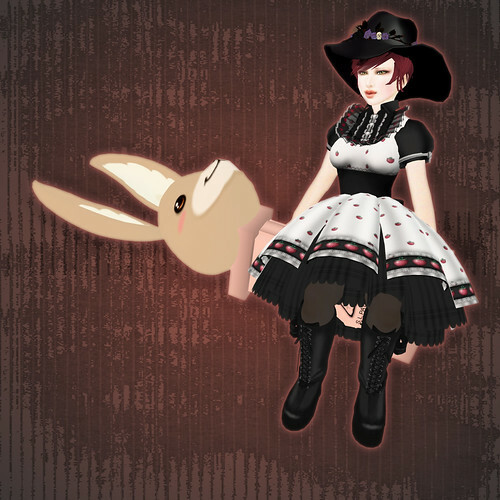 It's an adorable dress, and my modest avatar decided to put the Niniko group gift bloomers on beneath it so that she wasn't giving a free show. (Nope, she charges at least 10L for that kind of view!) The other gothy offerings at Sangre Noir are worth a look, too. (SLURL to Sangre Noir) The rest of this outfit was slowly dragged on after class. I admit that after I'm done with class, everything else leaves my brain entirely, so I stare at my inventory going: eh? Who? ...I taught comprehension today via Lil'Wayne lyrics. Hey, whatever works. P.S. -- Oy, people who run the Shopaholic Feed. My blog keeps getting randomly booted, with posts disappearing and such. What's goin' on? 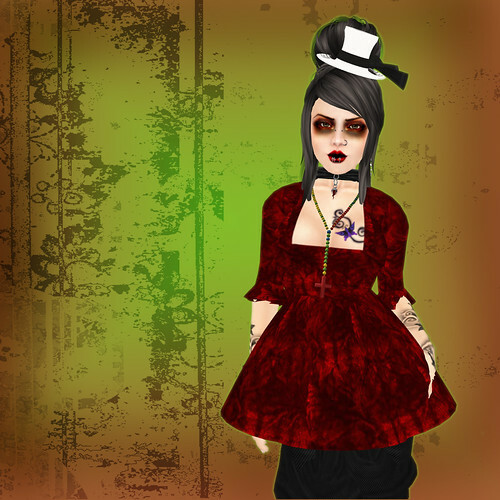 I put a Steampunk spin on these clothes and added some scarves from the new scarf, purse and belt shop named Puddles. I like the flyaway line of these scarves, and the soft colors. 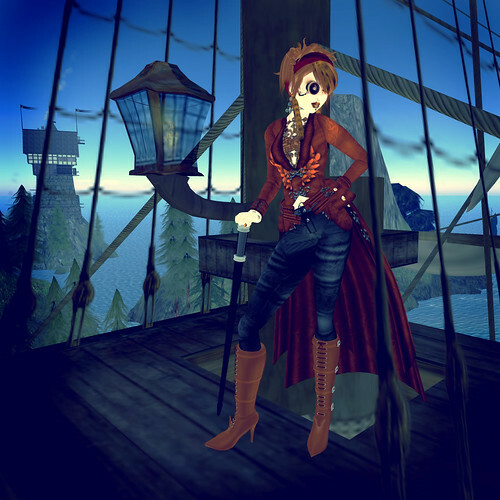 My avvie is all set to jet off in her airship... (SLURL to Puddles). I haven't entered this yet, but Teagan has put out a Science Fiction blogger challenge -- her outfit is really evocative. C'mon Grady Echegaray, I know you wanna.